One night when Flat Betty was working at the Ding Dong Dinner Diner, she heard this awful howling at the back door. When she went to see what it was, this dog stood there with his head up in the air, just a howling. Flat Betty could have sworn he was singing, “I ain’t nothin’ but a hungry hound dog, wailing all the time.” Well she felt so sorry for him that she let him into the kitchen and fed him some leftover hamburger (even though it was against county regulations and Judge Dither was sittin’ right out front eatin’ his dinner). Well, the next night there he was again, just singing away. So Flat Betty decided she’d best just adopt the dog and take him home before the Ding Dong Dinner Diner was fined. So she did. And since that dog seemed to sing so pretty, she named him Pressley, after Elvis of course. Now what she didn’t know at the time was that if you fed Pressley hamburger, it didn’t exactly agree with him and Lordy, ya had to wear a clothespin on your nose to be around him. The next week she saw an ad in the Tweed Town Journal about a dog show – one where you could win money. So she decided that surely Pressley could win with his singin’ - especially if she dressed him up in a hat and sunglasses! The day before the show she told her mother, Maude, (who she lived with) to absolutely NOT feed Pressley any hamburger. But Maude was gettin’ just a tad bit senile and fed Pressley a big ole hamburger for his lunch that day. Flat Betty and Pressley were in line at the dog show and just as the judges got about up to them, Pressley howled his song and let a BIG ONE! Miz Primpkins, the head judge, fell over in a dead faint and Flat Betty quickly stuck a clothespin on her nose (ya see she carried it everywhere with her, just in case). Needless to say, Pressley didn’t win the big money THAT day. MORAL OF THE STORY: Watch out for howlin’ dogs and always carry a clothespin! 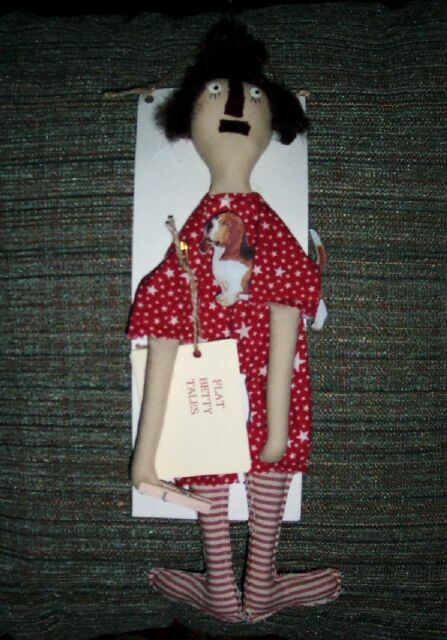 Flat Betty should have her own cartoon series on tv. Flat Betty's adventures.. The book, the film and a cartoon... All sounds good to me, your sense of humour is perfect. You do realize you are totally hilarious!